H & M Leasing Corp.
H & M Leasing Corp. was founded in 1997 by a brother and sister and remains today a small family business. “We are keenly aware that many view clothing recycling with a skeptical eye. There those companies who collect and recycle clothing. Claiming to donate money or clothes to charity, but do neither to fulfill their promise or they make a meager show of it. We reject these companies and their tactics. As a small family run business built on solid business principals and a strong sense of ethics, we strive to be fair, honest, responsible and most of all, open in all of our dealings.” – M. Field / President – H&M Leasing Corp.
Our company is BBB accredited and is registered with the New York, New Jersey, and Pennsylvania Charities bureaus as professional fundraisers and we are also registered as a textile recycling firm in the States of Ohio and Connecticut. This means that every contract we have with a charity is on file and all our financial dealings are reviewed by each respective state’s Attorney General’s Office annually. Since, 1997, we have established partnerships with charities and municipalities that we are proud to say have resulted in thousands of dollars being transferred to these organizations for their use and benefits. These are monies that sorely needed by the non-profits for their survival and much appreciated by them. Our services also benefit the municipalities we serve by recycling solid waste and providing additional income to the communities we service. 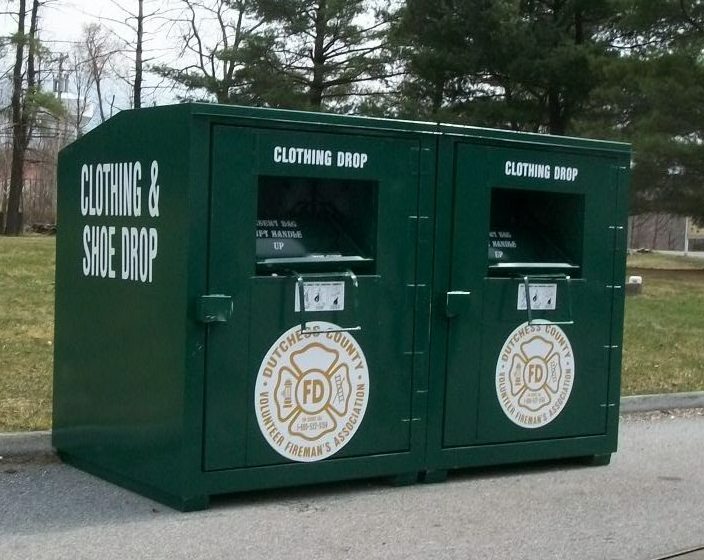 All of our collection boxes are built and maintained in our facility here in Copiague, NY. We construct each one to be aesthetically pleasing and functional to each location with safety as our primary goal, while tastefully representing the mission and goals of our clients. The locations that we inhabit are visited both day and night to insure good housekeeping and promote our standards of safety and professionalism. Our pick up procedures include the taking of photographs of each bin as we arrive and after we collect, to provide our clients the proof and promise of maintaining their charitable and corporate images. The clothing and accessories are harvested by our trucks processed and then sold in bulk. This rapid turn over of product has given us the cash flow to fund our clients in a timely manner and rewarding fashion. A tried and true method that insures our credibility.